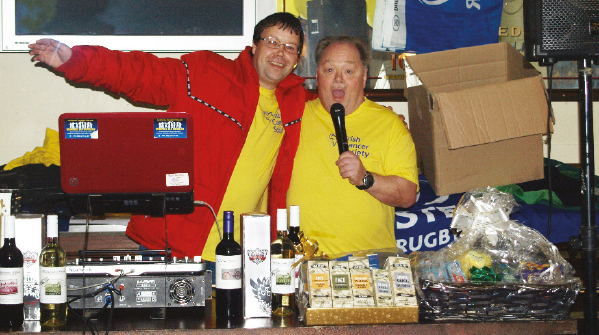 David Doyle, and MC for the night Paul Doyle. Photos by Eoin Meegan. There was a sense of jubilation at the cancer fundraiser in McCloskey’s Donnybrook on May 12th, which we mentioned in the last issue of NewsFour, when the targeted €1,000 goal was exceeded. The figure raised by the end of the night was over €1,200, and still rising, as people continue to drop in with donations. In previous years, the total raised had been a disappointing €500 to €600, so this year an all-out push was made to break the €1,000 barrier. Among those he wished to thank were Joe Cronin of the Pro14 Group for the tickets to the Pro14 final in the Aviva; Kian O’Sullivan for generously getting the GAA ball and jersey signed by the Dublin players; Sean Gilley of Terroirs for wine; Elliots Cash and Carry; Marian from Wilde’s of Donnybrook, who donated beauty products; Tom Brady, everyone’s favourite barman in Donnybrook for the souvenir hurley; Martin Finglass and Dublin Bus for the City Tour tickets; not forgetting local resident Annie Delaney who donated a cooker, among other things, and Noel Gibbons for a toolbox. Apologies if we left anyone out. Thanks also to the Donnybrook Residents’ Association, and all the local shops and businesses for their kind donations, and to all those, too numerous to mention, who contributed so generously. Of course, it wouldn’t be a success without the Munchkins on the ground who volunteered their services on the night and in the lead-up to the event. David would especially like to thank them with particular mention to Audrey McNevin for doing everything, local taxi driver Martin McGibney, who modelled on the night and MC Paul Doyle. A big thanks too to McCloskey’s for supporting the event for the last number of years and who helped with posters and catering; particularly to Tom, Joe and John who worked diligently on the night to ensure everyone had a good time. Also, to the Irish Cancer Society for their generous support. Finally, a big thank you to all who came on the night, bought raffle tickets, and made the occasion the huge success it was. Remember, you can still donate by popping into McCloskey’s pub in Donnybrook and putting something into the cancer donation box. Thanks all.